Made with premium quality foam, our promotional can coolers are a favorite for weddings, giveaways and other brand awareness events of the like. Available in multiple color options that include white, black, royal blue, red green, purple and others, they’re durable and lightweight, and can be custom printed with names, a logo design or event date to memorialize your special occasion. Often referred to as beer sleeves or coolies, these unique can insulators hold most 12 to 16 oz. cans, but also long neck beer bottles, and small water bottles. 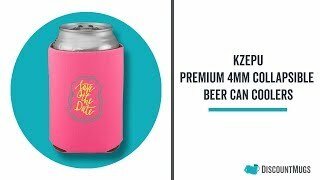 Shop our affordable can cozies and KOOZIE® brand coolers wholesale to save with our Guaranteed Low Prices and take advantage of our Free Shipping offer on select orders. White coverage could have been better. Great price and received quickly. Just what I wanted them to look like. Colors and design are perfect Thank you! Spectacular, super helpful customer service. Our koozies came out perfectly for an event. We used transparent logos for each side and they did not have the iron on look. Order arrived 4 days late but still in time for event.